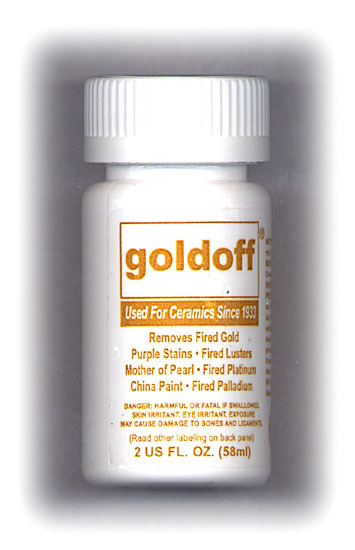 GOLD OFF removes Fired Gold, Purple Stains, Fired Lusters, Platinum & Palladium, Mother Of Pearl and China Paint from Ceramics. DO NOT USE TO REMOVE GOLD FROM GLASS. Gold Remover. Chemically removes fired gold and similar products. FOR USE ON CERAMICS ONLY.